Students start by using booleans to compare the current value of a sprite property with a target value, using that comparison to determine when a sprite has reached a point on the screen, grown to a given size, or otherwise reached a value using the counter pattern. After using booleans directly to investigate the values or sprite properties, students add conditional if statements to write code that responds to those boolean comparisons. This lesson follows closely the booleans model that students first experienced in the Booleans Unplugged lesson. As before, we start with using booleans directly before using booleans to trigger if statements. 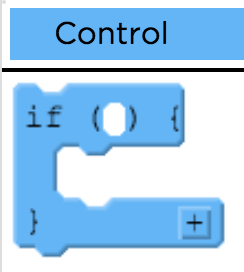 In the following lesson we will introduce some boolean producing blocks, such as keyDown(), which can be used in place of simple boolean comparisons to write programs that respond to user input. Boolean Expression - in programming, an expression that evaluates to True or False. Goal: At the end of the Boolean Question game from the previous lesson, students began adding conditions to their boolean questions - meaning that if the answer to the question is true, something should happen. Before programming with conditionals, we want to make sure that students have a solid understanding of what booleans really are. How many different numbers are there in the world? How many different words or combination of letters and other characters are there? How many different boolean values are there? Discuss: Students should realize that the first two questions (numbers and strings), are essentially infinite, but that booleans are limited to two states. As you begin programming today, you'll be using booleans to make programs that change their behavior depending on the answer to those boolean questions. Transition: Send students to Code Studio. Journal: Think back to all of the programs you've written so far; how might you use conditionals to improve one of your programs from past lessons? What condition would you check, and how would you respond to it? Which result will be printed in the console by this program? The simplest Boolean expressions are questions that the computer can answer with true or false. These expressions are made using comparison operators, as shown below. 1 < 9 Is 1 less than 9? 1 > 9 Is 1 greater than 9 ? 1 == 9 Is 1 equal to 9? Note: If you saw the statement 3 < 2 in math class, you'd think something was terribly wrong, but this is not math class. In computer science, the comparison operators ask a question that the computer will answer with true or false. So you can read 3 < 2 as "Is 3 less than 2?" The answer in this case is no, or false. Another way to say this is that the Boolean expression 3 < 2 evaluates to false. Can you modify the values of the sprite properties so that each of the Boolean expressions evaluates to true? Read through the entire program to see how sprite1 and sprite2 are being created and which properties are compared. For each of the Boolean expressions, identify the sprite properties being compared. Change the code in the first 11 lines only so that each of the console.log() statements print true. In the past few levels, we have been comparing values of sprites to find out whether something is true or false. Let's start putting that in the context of an animation. The program draws a race car and a finish line. We are going to figure out when the race car crosses the finish line. The sprites have all been set up for you. Add an Boolean expression inside the console.log that asks "Is the x position of the race car less than the x position of the finish line?" Look at the output of the program as the car moves. When does the output change? Why? Let's use one more Boolean expression to check the condition of a sprite. You can use a console.log command to check whether its scale is 2 yet. Add a Boolean expression inside the console.log that checks whether the apple.scale is greater than 2. The Boolean expressions you used earlier allow us to ask questions, but in order to respond to those questions, we need to use an if statement. if statements usually go inside your draw loop because we want to check them each time the loop runs. The race car program you wrote earlier is loaded here for you. Add an if statement after you update the position of the race car. Move the Boolean expression from the console.log statement to the condition of the if statement. Inside the if statement add a statement to draw text on the screen to say "Winner". Now that we know how to use if statements, you can do more than just check if the apple has reached a scale of 2. You turn it into a pear once it happens. Use a conditional in the draw loop to check whether fruit.scale is greater than 2. If it is, change the fruit's animation to "pear". Challenge: Can you also make the fruit stop growing once it turns into a pear? Sometimes it's useful to hide the image for a while and then show it again. You can do this using the visible property. The visible property is a little different from other properties you have seen in the past: It is a Boolean value, either true (the sprite is visible) or false (the sprite is not visible). By default, visible is set to true. Make the balloon pop when it hits the edge of the game area! Add a conditional that checks to see whether the balloon has hit the edge. Use a watcher on balloon.scale to help you out. Create a pop sprite which uses the "pop" visual in the animation tab. Use the visible property to keep the "pop" sprite hidden at the beginning. Inside the if add two statements. One that sets the visible property to hide the balloon sprite. One that sets the visible property to show the pop sprite.